During the 1970’s Pauline founded her own Company. 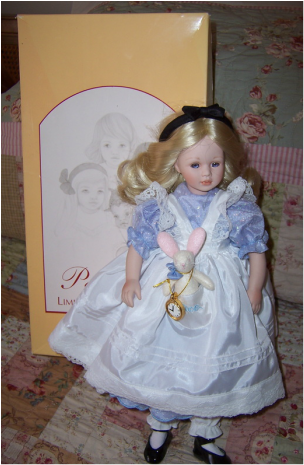 Over the years Pauline designed both rag and vinyl dolls and then in 1988 released her first porcelain range. Pauline Bjonness Jacobsen has become well known for making exquisite dolls both in the form of rag, vinyl and porcelain dolls. Alice is so pretty and stands 43cm tall (17"). She is dressed in blue and white cotton print dress with puffed sleeves. She has white pantaloons, and is wearing black Mary Jane type vinyl shoes with white socks. Her jointed companion friend - bunny rabbit is with her. He is wearing a blue bow time around nis neck. He is 24cm tall from the tip of his ears to the bottom of his feet. Alice has painted eyebrows, open blue glass type eyes, lovely blush to both cheeks, and a little pink closed mouth. She has a glorious head of long blodne straight hair. She has a vinyl head,, 3/4vinyl arms, 3/4 vinyl legs and a white cloth stuffed body. She comes in her original box (the box does show wear), markings to stomach, original outfit (no markings), original tag on bunny rabbit, original Certificate of Authenticity (COA) and original hang tags. What a great idea. A doll trunk to keep your little doll and her clothes all together. The trunk is made of pink & white metal, had a white plastic carry handle, and inside is covered with paper/cardboard lining with gold stars. It is 32cm x 15cm x 15cm. It has a metal gold clasp lock on the side. When it is open, one side is for hanging your clothes with a cardboard drawer, and the other side is for your doll. 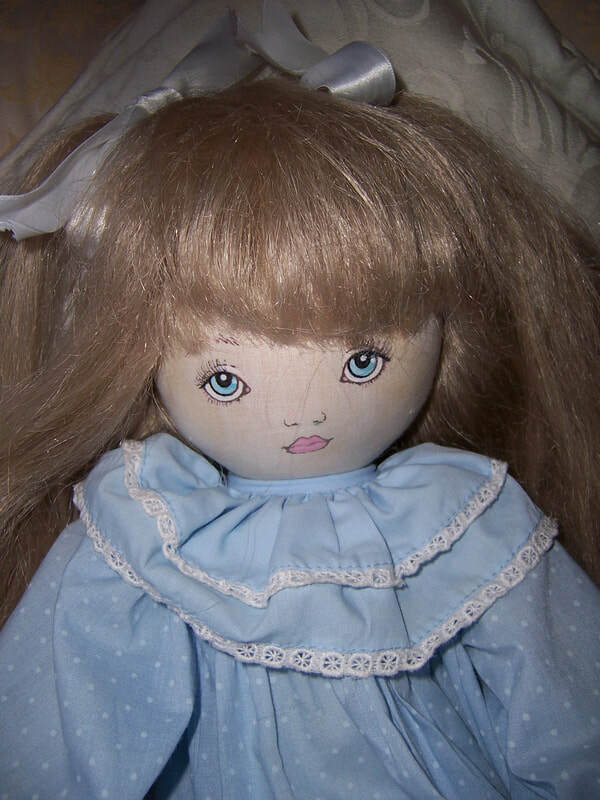 The doll has a heart shape on the back of her neck with PBJ inscribed inside it and 1984 underneath it. She is approx 28cm tall, has short red rooted hair, open and shut blue eyes with original fringed eyelashes to both eyes. She is made of a vinyl head, arms, legs and a cream cloth body. She is wearing a tagged Pauline dress which we believe to be "Red Riding Hood" outfit along with her basket to take to Grandma's. On her feet are red shoes with white socks. There are some aged marks to her white apron which may come out with a good soak. - black felt scottie dog. If you collect the small Pauline dolls then this little collection will be for you. 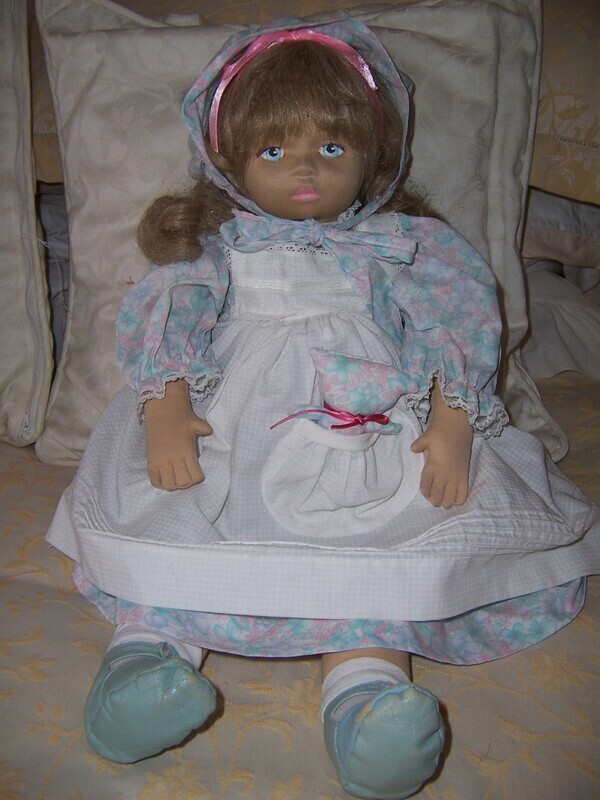 This doll was made by Pauline Bjonness Jacobsen in 1984 for Kate Finn in Sydney Australia. a Pauline Bjonness Jacobsen design"
Her head, arms and body are made of white stuffed fabric and her legs are made of blue stuffed fabric. She has a fringe with long blonde straight hair.
. original tagged blue cotton type dress fabric with white spots on it, removable blue collar in same fabric, and long white pantaloons which are edged with the same white lace trim (elastic a little loose). She is a lovely example of a rare cloth rag doll made by Pauline for Kate Finn Sydney Australia. 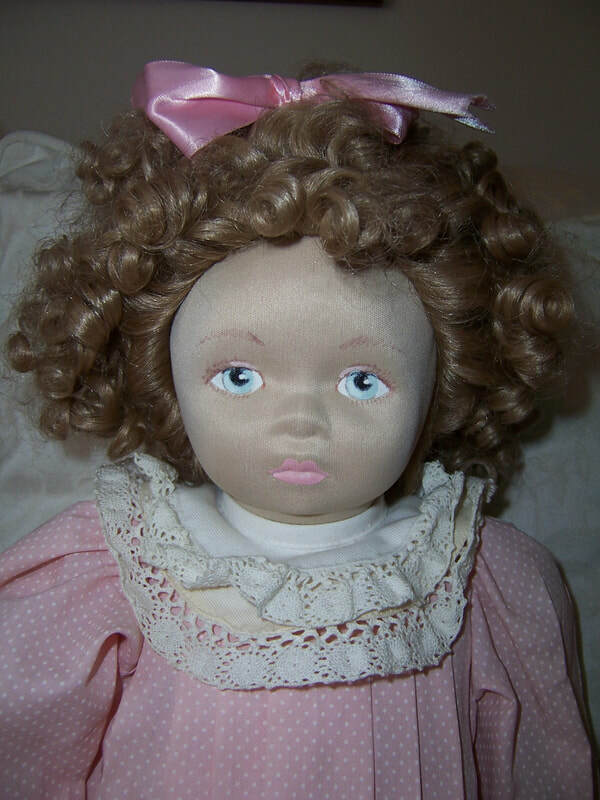 This doll is just so cute, would be circa 1993 . She is a cloth dollwith a sculptured face and has a stocking type body which has the look of a Lenci doll about her. Her facial features have been handpainted, and she is wearing a brushable nylon wig on her head.
. dress has Pauline's cotton tag to it. This doll is called Daphne and she is just so cute. She is a cloth doll with a stocking type body (similar to the Cabbage Patch dolls) and her face has the look of a Lenci doll about her. Her facial features have been hand painted, and has a sculptured look. She is wearing a curly nylon wig on her head which can be brushed and washed. Her pink and white spotted pleated drop waisted cotton type dress has the Pauline tag to it. On her feet are her original white socks, and original pink vinyl strap shoes. In her hand is a fabric rose. Pauline Bjonness Jacobsen is so well known for making exquisite dolls, and Alice is no exception. Alice comes with her original outfit, rabbit, clock, headband, and original box.